SIGN UP to receive our newsletter with the latest industry and product news from Aspera. Aspera CLI for IBM Cloud Private: First release of the Aspera Command-Line Interface that is natively integrated with IBM Cloud Private and built on open standards using Docker and Kubernetes. High-Speed Transfer Server, High-Speed Transfer Endpoint, and Desktop Client 3.9 for AIX: Adds a new encryption module that results in faster transfers and lower CPU load, a new rate controller option that prevents overdrive failure, and enhanced integration with Aspera on Cloud including activity logging. Drive 3.1.6 for Windows and Mac: Adds support for address space layout randomization (ASLR) security. 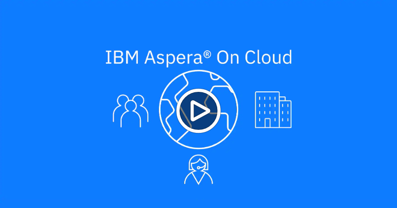 Learn how IBM Aspera on Cloud, our flagship hosted service, allows organizations to quickly and securely move files of all sizes anywhere over commodity networks to overcome common challenges of enabling hybrid cloud and multicloud infrastructure. Our very own streaming expert, Jonathan Solomon, discusses innovations in streaming broadcast quality video over unmanaged IP networks. In this article, he highlights the challenges organizations face and how Aspera’s FASPStream technology overcomes limitations of live streaming over TCP. BitCine, creator of the CineSend cloud-based media asset manager, integrates Aspera on Cloud to enable fast, reliable transfers to and from their hosted platform. In this article, BitCine founder Colin Carter explains why they chose Aspera, and how it benefits their customers.